Or the lack of it!!! This is a short stub of an epiphany, that I had in a morning waiting for the School shuttle. How amazing is Memory! Of course, I'm talking about our memory. In the brain(may be). The concept of content addressability is so awesome. - I can sing a really old song, from somewhere in the middle, with incorrect lyrics. and very likely you'd recognize. This is so darn expensive (computationally). Ask Google - how it would love to have CAM. We often forget an even more bizarre phenomenon - Forgetting itself. How painful would it be, if we remembered, every single fight that we ever had? Some how we've evolved to forget the unpleasant things, in the same time remember the important ones. Just knowing that, it wouldn't matter as much tomorrow, helps. Blog of my runs, biketrips, Poetry, Life and much more. - And thats why I love You..
- Mind Games and Mixed Signals..
- Ever feel like giving up? 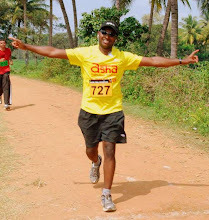 I run for Asha! Support me.